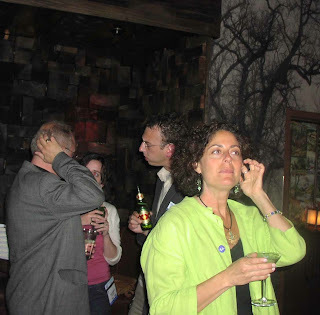 After a rousing Council meeting (not to mention a killer party - see pics at the bottom!) at BEA, Emerging Leaders is back on track! With a revamped Mission and some new Council Members, we couldn't wait to share our plans with you. 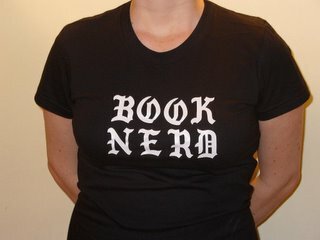 Our goal is to have each region represented by an under-40, non-owner bookseller. Know someone (or are someone) from the Midwest and/or Great Lakes regions who might be interested in joining the Emerging Leaders Council? Drop us an email! Emerging Leaders aims to develop, retain, and support the independent book industry's future innovators and leaders, through peer support, networking, mentoring, and education. Emerging Leaders is tailored, but not restricted, to booksellers age forty and under, who are determind to work in the industry and who demonstrate a passion for bookselling. Yes, the Emerging Leaders: Owners track has been jettisoned - we felt we couldn't serve both constituencies well, and we'd do best to focus on the young, frontline folks, as there's lots of programming out there for owners. We're sad to lose Susan Weis on the Council, but she'll still be contributing her amazing ideas as part of our Emerging Leaders Alumni Advisors! 1) A revamped Website: This will have all the info you could ever need about EL, plus updates to keep you informed, not to mention forums, resources, photo albums, and more! 2) Gathering Guidelines: Emerging Leaders is more than just meetings and parties at tradeshows; many regions have already started to have gatherings in various cities, to bring together EL booksellers in their areas, and some have been great successes. To keep these local events moving and to provide more places with the opportunity to have one, we are putting together guidelines with all the info you need to make a great gathering: do's and don'ts, how to get free stuff, who to contact about authors, etc. 3) Programming: We believe that EL booksellers have a specific set of educational interests, and need more programming to suit them! So we're working with the ABA to provide programs at regionals, trade shows, and Winter Institute, targeted towards our issues. 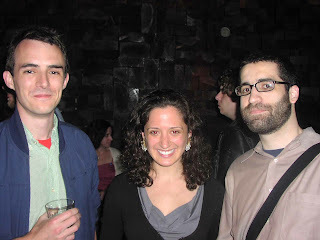 4) Scholarships: We'd love to see more EL booksellers at trade shows, regionals, and conferences. To that end, we'll be working to expand the Emerging Leaders Scholarships to BEA and Winter Institute. There's more in the pipeline, so keep an eye on your inbox for updates. If you have any questions, suggestions, feedback, notes from past EL gatherings and parties, feel free to email your regional Council member. 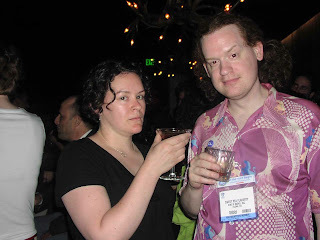 Also, we're on the lookout for pictures from this year's party, shots of EL booksellers at BEA -- anything EL related, really -- for our photo album! And here are some such pics, courtesy of Lisa. 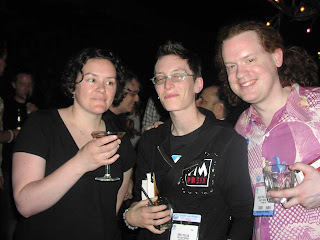 Hooray for parties sponsored by BEA -- thanks so much to Lance, Beth, and everyone who helped make this happen! And there are tons more, but most of them are people I don't know (which means this thing is expanding, hooray! ), or they feature MY boozy mug, which you don't get this year. Be sure to email us if you've got pictures from the party or other EL-ish activities. And keep your ears open for more from us!